On population, both some religions and some governments have favoured and promoted population growth strongly at times - go forth and multiply to strengthen our religion or our country ! And in other times and places social pressures have favoured lower birth rates as 'responsible parenthood' and limiting population growth. Clearly limiting populations may help to reduce the extent of poverty with less mouths to feed, and expanding populations may increase poverty though not always. In some societies these social pressures may center on 'big families are good' or 'big families are bad' social admonitions. But social pressures can in some cases include much tougher measures such as contraceptive aids being banned or taxed - or being issued free or made compulsory. Of course not every individual will follow prevailing social pressures, but the majority generally will. Churches may even encourage their preachers to grow the church by making lots of their parishioners pregnant, and may be unconcerned if that is with parishioner wives or with parishioner children. Of course they will normally keep such a church policy secret and keep preachers names off birth certificates, but church rules may include banning preacher marriage and/or banning contraception. Various types of punishment measures can also be used by some churches and governments to enforce subjugation, and government collusion with some church can often involve secrecy on the part of both. Hence the Republic of Ireland government has in the past taken 'legal' action (and may still now) against residents claimed to have been baptised Catholic, while allowing its Catholic Church to keep all its baptism records secret. There are other governments undoubtedly acting on similar unspoken arrangements with other churches, often unconstitutionally. But it may be only a bigger or smaller part of church and government that goes evil, taking parishioners or citizens as subjects of no value. Whether religion or politics are dominant in a government, it will of course generally be the non-poor who control the chief social institutions and decide the prevailing social pressures - mainly as whatever they see as being in their own interests. And part of that may be controlling and exploiting a poor they think needs to be kept poor. However having a poor does not promote wealth growth, but instead chiefly encourages exploiter inefficiency that retards wealth growth. Now it can be that the only substantial business is government business, and then the chief issue is how well or badly that is run. But where there is substantial non-government business, the chief issue can be how well or badly government handles that. In either case the main business aim may be either an easy life with no change and steady profit, or increasing profit with growth and innovation progress. A range of different government policies to help business may encourage one business option or encourage the other business option. The easy-life business option is generally encouraged by cheap-labour poverty and also by closed-shop discouragement of new or non-mainstream science progress thinking. And sometimes it is easier to keep things as they are, while other times may see stronger pressures favouring progress. Religions and governments may or may not economically exploit workers less than rich businessmen employers, but they may generally tend to be less efficient at running business than the average businessman. Since business is less of a priority to them, where society is more dominated by religion or government it may tend to more inefficiency poverty. This form of social poverty generation some call central planning poverty, but such economic inefficiency often also results in societies with business monopoly which removes the efficiency spur of competition from business. Of course competition encourages efficiency in business due to competition being an often fatal threat to a business, and so survival of the fittest can give a Darwinian business evolution. World poverty reduction basically requires inquisitive and experimenting science and well managed global competition, both of which involve problems with the latter certainly the more problematic, and may mean that different policies may be needed for different countries. Successful wealth-creating business needs to really be centered on competing for profits, but this needs some real social anti-poverty regulation also - such as minimum wage law and minimum social welfare - to really encourage social wealth instead of social poverty. Poverty can be strongly affected by just one or two particular needs that those running countries should safeguard but often fail to do so. 1. In many poor countries the poor are very dependent on having a good water supply, but in many cases it either does not exist or is controlled by a monopoly that makes excessive charges for it. 2. In some richer countries the poor are very dependent on having a good electricity supply, but in many cases that either does not exist or is controlled by a monopoly or a cartel that makes excessive charges for it. 3. Governments or religions running countries clearly have a duty to protect the poor in these cases, but some make little or no real attempt to do that. In richer countries especially, trying to target poor people can create too many problems so that often poor people can be helped more by targeting them less. Hence the UK Child Benefit for everyone with children (rich, poor, unemployed or working) did almost certainly do more good for UK poverty than some of the more costly targeted benefits. January 2010 UK news headlines included a government minister publicly admitting for the first time that UK middle-class governments have not understood the UK poor. Of course the UK is not alone in having that widespread problem. Virtual Poverty and Virtual Exclusion. Richer countries like the USA and UK have also over recent years been building up a new real poverty and exclusion problem that can be called 'imagined poverty' or 'virtual poverty'. This largely involves children being given an incorrect view of the average family as being significantly richer than the average family really is, so that many from average families now think they are poor. Hence a substantial number of 'virtual poor' can be created by modern advertising, TV and film especially in richer countries or developing countries. 1. Advertising. Those selling more expensive products at higher profit margins have more money to spend on advertising than those selling cheaper goods at lower profit margins. So advertising does tend to present average people as buying more expensive goods than the majority of people actually buy. The advertising 'virtual average person' is richer than the average person actually is. 2. TV and film. Those making TV programs and films targeted at the young commonly present 'virtual average families' as richer than the average family actually is. Hence the Disney TV show 'Hannah Montana' basically presents a multi-millionaire family as 'typical' to the young people that it successfully targets. The TV and film 'virtual average family' is richer than the average family actually is. Hence the UK today may have only 10% who are actual relative poor, but may have another 20% who are actually in the average majority but have been made 'virtual poor' by exposure to modern advertising, TV and film. And these 'virtual poor' will feel that they suffer 'virtual exclusion' in not being able to buy what they wrongly believe that the majority can buy. There is a real problem for some countries where this 'virtual poverty' problem, added to some real poverty problems, may have in part contributed to events like the recent 2011 street riots in the UK. And current UK 'virtual poverty' and 'virtual exclusion' creation shows in a recent Children’s Society and University of York study of children aged 8 to 15 giving their views on social exclusion. UK 21st century children feel 'deprived' if their family does not have most of the popular 'normal possessions' including in importance order 'some pocket money', 'some family holidays', 'some iPods', 'some good clothes', 'a family car' and 'good TV'. It may need some more regulation of advertising, TV and film that is targeted at the young - and the problem may be less in the currently censored '18' films and adult TV area than in the 'PG' films and kids TV area !? 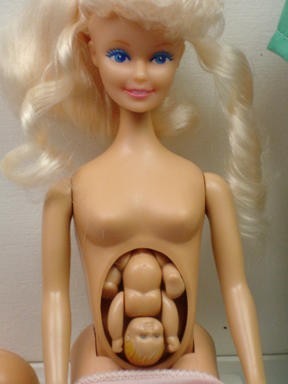 A doll to encourage girls to have babies ?